Nearly 40 percent of adults in the United States are obese, according to the Centers for Disease Control and Prevention. Many weight-loss diets leave people feeling hungry, making the diet plans difficult to follow over the long term. Prescription medicines are sometimes used to help suppress appetite, but only under the direct care and supervision of a doctor. Those struggling to lose and wanting to try medicine should consult with their personal doctor for advice and suggestions. It's no secret that excess weight isn't good for health and increases risk for a number of chronic conditions, such as heart disease and diabetes. While a variety of strategies may help with weight loss, diet and exercise are the first place to start. After six months of eating right and working out without success, however, prescription medications may be considered for certain people, at the discretion of their doctors. Most of these medications also require a person continue to follow a reduced-calorie diet and exercise plan. These medications are generally reserved for those who are obese, defined by having a body mass index of 31 or greater. The drugs may also be appropriate for those who are overweight -- with BMI of 27 to 30 -- and have a health issue such as heart disease. Appetite suppressants, also referred to as anorexiants, work by affecting brain chemicals called serotonin and norepinephrine. The drugs help keep more of these satiety hormones circulating in the brain to promote feelings of fullness -- so people eat less. Phentermine is one of the most commonly prescribed appetite suppressants, according to a 2014 review article published in the Journal of Menopausal Medicine. Due to its potential to be addictive, it's only recommended for short-term use, up to six weeks. Like many prescription medications, phentermine may cause side effects such as dry mouth, constipation, diarrhea or vomiting. More serious side effects include high blood pressure, heart palpitations, chest pain, insomnia, shortness of breath, leg and ankle swelling and dizziness. 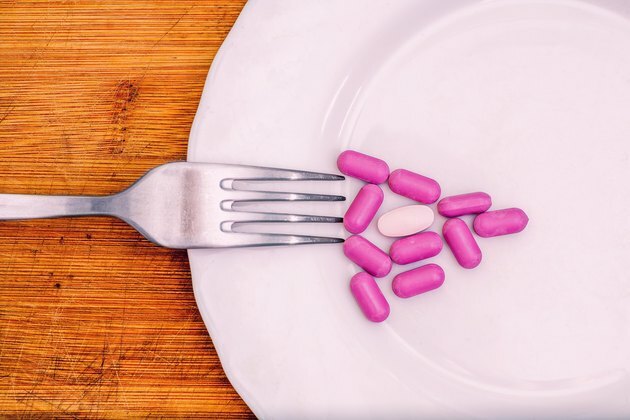 Phentermine may be especially helpful to those really struggling with hunger, according to a 2016 study published in Obesity. This small study found that phentermine helped control hunger better, and assisted in helping promote more weight loss, in obese people who had significant difficulty managing their diets because of hunger. Phendimetrazine, which works in a similar fashion as phentermine, is also considered habit-forming and not to be used for more than 12 weeks. It comes with a number of side effects including dizziness, nausea, constipation, diarrhea or upset stomach. People taking the medication should contact their doctor immediately if they experience mood changes, nervousness, headaches, shortness of breath, shakiness, chest pain, alterations in heartbeat or trouble passing urine. This medication should be used cautiously. A case report published in 2008 in Cases Journal noted a 54-year-old woman who took phendimetrazine experienced cardiac ischemia -- a condition in which the heart doesn't receive enough blood and oxygen, which can lead to death of heart muscle tissue. Another medication used to help control appetite for weight loss is diethylpropion. Again, this medication works best when used in conjunction with a low-calorie diet and should be used only for a few weeks. Diethylpropion may cause gastrointestinal and anxiety-related side effects similar to the other appetite suppressants. People taking this medication should contact their doctors if they experience symptoms such as skin rash, itching, difficulty breathing, sore throat, chest pain, blurred vision, fainting or swelling of feet and ankles. Bupropion, an antidepressant that also decreases appetite, has been shown to help promote weight loss. However, it's not prescribed specifically for weight loss. The drug is prescribed to treat multiple psychiatric disorders ranging from bipolar disorder to seasonal affective disorder. It's also used as a method to help people stop smoking. In addition to appetite suppression, other side effects include nausea, vomiting, dry mouth and stomach pain. More serious side effects include seizures, hallucinations, muscle or joint pain and changes in heart rate.